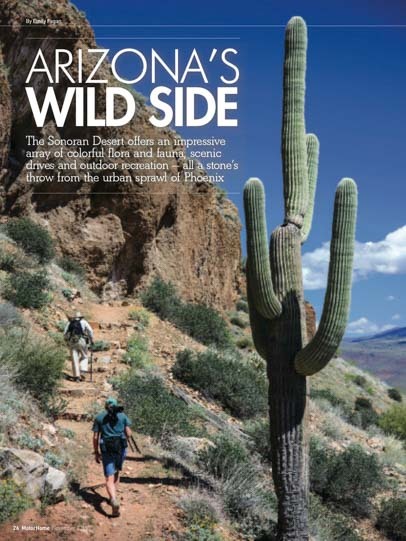 Motorhome Magazine Feature – Arizona’s Wild Side! The November 2015 issue of Motorhome Magazine features our article about beautiful central Arizona entitled Arizona’s Wild Side. Motorhome Magazine posts links to most of their destination articles on their website, and when one appears for this article we will link to it here. Motorhome is an excellent monthly magazine for all RVers, whether you are excited newbies or seasoned pros who’ve been at it for decades. But is there really a place for a professionally written and edited RV magazine in this era of online blogging? I think so. Motorhome Magazine offers loads of tech tips, and the beauty of their technical articles is that they are read and edited by a number of experienced RV techs before publication, something that doesn’t happen with an ordinary RV blog (including this one!). Even better, Motorhome offers oodles of mouth watering travel destination articles suggesting fun places to take an RV roadtrip all over North America. In our household (and probably many others), whenever the various RV magazines we subscribe to arrive, Mark jumps on the tech articles and I run off to read the travel articles! You can subscribe to Motorhome Magazine here. I know you’re being inundated with great Christmas gift ideas right now (as we are), but in truth, a magazine subscription does make a wonderful gift. We’re giving quite a few RV magazine subscriptions as Christmas gifts this year in hopes of inspiring our friends to take their RVs out for a spin and to share a taste of this crazy lifestyle we live (Santa spoiler alert, Mom!). As for Arizona in winter, it is a glorious place to take your RV during the coldest months and explore some exotic scenery. Lots of snowbird RVers choose the southwestern deserts as a warm winter destination. As described in our magazine article, central Arizona is among the best places to visit. Anchored by the massive, sprawling city of Phoenix, there are loads of things to do, no matter what your interests are. We lean towards outdoor activities — hiking, biking and photographing Nature at her best — and central Arizona is filled to overflowing with places to enjoy these activities. The Apache Trail – Sensational Sonoran Desert Adventure! The Wind Cave Hike – The Hills Are Alive in Phoenix! Enjoy these articles, and if you have the time, brush the snow off your RV and come on down!! Like many websites, this site is an Amazon Affiliate. During the upcoming rush of online shopping, we profoundly appreciate anything purchased through any of our Amazon links (feel free to bookmark this one!). We blog out of passion and as a hobby, but it is massively motivating to know our readers appreciate our efforts. Your enthusiasm encourages us to bring you the highest quality writing, photos and info that we can. Happy Thanksgiving!! 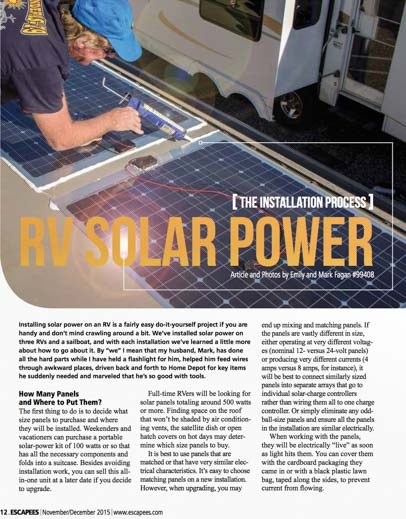 The Nov/Dec 2015 issue of Escapees Magazine is featuring our article about installing solar power on an RV. For us, solar power is by far the most valuable upgrade we have done to our rig, as it has given us unlimited freedom and spontaneity in our travels. This article is the second part of a two-part series on solar power systems we wrote for Escapees (the first, RV Solar Power, appeared in the May/June 2015 issue. There are a lot of little bits and pieces that go into a solar power installation but none of them are hard to understand. This article presents a general overview of some of the things to consider when you tackle a solar power installation, including how many panels to buy, which sizes and types make the most sense, how to wire the panels on the roof to the batteries in the basement, where to place the batteries in the rig and how to wire the batteries to the solar charge controller. WHAT ARE THE BEST COMPONENTS FOR AN RV SOLAR POWER INSTALLATION? Many people wonder which specific components they should buy for an off-the-grid RV or marine electrical setup, and there are many great systems and choices on the market, from pre-designed kits to individual parts. For beginners, weekenders and vacationers, a portable solar power kit may be all you need to get started without taking on the challenge of a full-blown installation. I sure wish there had been such a system when we first started living full-time in our 27′ travel trailer. For full-time RVers looking for a solution that has been pre-designed, a kit from Go Power or Renogy may work well. We have been very happy with polycrystalline rigid panels, and would go with 24 volt panels on any future installations, however folks with space constraints or rounded roofs might prefer panels that are 12 volt and/or flexible. Which Solar Panels to Buy – Flexible or Rigid? 12 or 24 volt? Mono- or Polycrystalline? We love our Outback solar charge controller, although our Schneider Electric (Xantrex) unit on our boat was fine, just less sophisticated. The Morningstar (TriStar MPPT) solar charge controller is also very popular and has an enthusiastic following. Our Exeltech inverter is a work of art designed by the manufacturers of the inverters that power the International Space Station. Exeltech inverters generate the best regulated sine wave output over the widest DC input of any inverter on the market today, and they are often used to power sensitive medical equipment. An Exeltech inverter is far more expensive than many other brands of pure sine wave inverters, but because it is the heart of the AC electrical system when dry camping, it is a worthwhile investment for anyone tha plans to boondock a lot. Magnum inverter/chargers are also very well thought of, and the installation is a cinch. Since our Exeltech inverter does have a built-in battery charging component, we rely on an Iota Converter and Charger on the rare occasions that we pllug into shore power via our portable gas generator or electrical hookups. Which Solar Panels To Buy? - What's Best: Flexible or Rigid Panels? 12 or 24 volt? Mono- or Polycrystalline? And WHY? Wet Cell vs. AGM Batteries PLUS Wiring Tips – Why we upgraded from Flooded to AGM ~plus~ Best Wiring Practices! RV and Marine Battery Charging Basics - How do batteries get charged and what is the best charging method? Converters, Inverter/Chargers and Engine Alternators - No two battery charging systems do the job the same way. Solar Power and Shore Power Combined! - What happens when you run two charging systems at once? Solar Power Tutorial 1 - Basics - What makes up a solar power system and how does it work? Escapees Magazine is published by the Join Escapees RV Club, a unique club dedicated to the needs of full-time and long-term RVers. Founded in 1978 by pioneering full-time RVers Joe and Kay Peterson, this unusual organization serves all RV travelers with a top quality mail service, a network of discounted RV parks, a variety of methods for campsite ownership and long term rental, special interest groups, training events, rallies, travel excursions (RV and otherwise), adult day care, insurance guidance, a directory of boondocking sites and more. Oregon’s Wallowa Mountains (and more) – In Trailer Life Magazine! One of the most beautiful and remote places we have enjoyed in our RV travels is the eastern part of Oregon. The Wallowa Mountains are a little visited treasure that hug the sparkling clear waters of Wallowa Lake. Nestled at the base of the mountains near the lake is the charming village of Joseph, home to just 1,000 residents. How remote is this area? Joseph is 6 miles from the next town, Enterprise, which is home to just 2,000 residents! The October 2015 issue of Trailer Life Magazine features our article about the many wonderful things there are to see and do in eastern Oregon. What makes the Wallowa Mountains and the town of Joseph unique is that they lie at the end of the road rather than along a road that leads to somewhere else. On the way there, Baker City is a wonderful town to visit, and if you go in June, you can watch the fabulous finale of a four day bicycle stage race that winds all through the city streets while sipping a beer in a front row seat outside a brewpub. Once in the Wallowas, there are unusual rides — one on a bicycle railcar on the old narrow gauge train tracks in the valleys and another on a tram that goes up to the top of the mountains — and there is beautiful lakeside camping, a town full of exquisite bronze sculptures and hikes among the wildflowers on the mountain tops. Hiking into the peaks above cute little Joseph, Oregon. We’ll be back! Trailer Life Magazine was one of the first RV magazines to be published and first appeared on newsstands in 1941. When we watched the old 1954 movie The Long Long Trailer starring Lucille Ball and Desi Arnaz, we were surprised to see images of 1950’s era issues of Trailer Life magazine in the movie!! For both new RVers and old pros alike, this is a good magazine to learn various RV tech tips, get inspired to travel to different destinations across the country and stay in touch with the latest developments in the world of towable rolling homes. Subscriptions to Trailer Life are available here. We have published several articles in Trailer Life Magazine, and you can read them all at this link. For another perspective on RV travel to the Wallowa Mountains in Oregon and for more beautiful photos from the town of Joseph, check out the four blog posts written by Nina Fussing from the RV blog Wheeling It. Escapees Magazine Cover Photo + Photography Tips! We are delighted to have another photo on the cover of Escapees Magazine in the September/October 2015 issue. This photo was taken just after the peak of the magnificent autumn colors in Colorado’s San Juan Mountains. We were fortunate enough to be there for a few weeks, soaking up Nature’s incredible display. One morning we woke up to find our buggy and everything around it covered in snow. Inside this issue we have a feature article offering a few pointers we’ve learned about how to take great photos. We weren’t photographers before we started traveling in our trailer in 2007, but living this life of sightseeing throughout North America’s most beautiful places has made us eager to improve our skills. While I spend many happy hours writing magazine articles and blog posts, Mark sits next to me studying photography. And when that boy decides to learn something, he dives in deep! In a few short years he has plowed through a steady stream of photography books, ebooks, tutorial blogs and more. Luckily for me, as we sit side by side, he gets so excited about what he’s reading that he often reads aloud. So, we have learned together, which has been great fun, even though it can be a little tricky sometimes for me to write and listen to his photographic words of wisdom at the same time! Enhance Your RV Travel Photography Skills. I’ve got lots more tips and share all of our favorite photography resources and learning tools and also list all the camera gear, backpacks, filters and software we have used over the years in this post: Photography – Cameras, Gears, Tips & Resources. 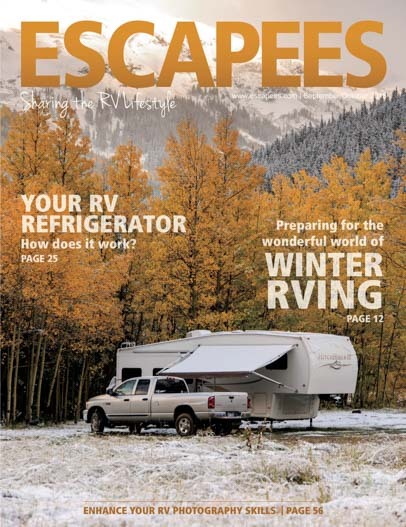 Escapees Magazine is the membership magazine for Escapees RV Club, a wonderful club that brings together RV enthusiasts from all walks of life and that drive all kinds of rigs. Besides their outstanding magazine, one that covers a wide enough range of topics to include something as off-beat at photography tips, Escapees is also the biggest RV advocacy group out there. For that reason alone, anyone with an RV should be grateful. Escapees looks after the unusual needs of all RVers, especially full-timers whose unique lifestyle could often leave them falling through legal cracks. Among the many other things Escapees’ advocacy work includes ensuring that overnight parking in commercial parking lots remains possible. Escapees / Xscapers RVer survey. This information will help them in their future RV advocacy efforts! 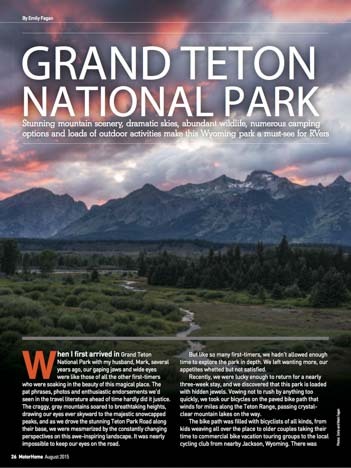 Grand Teton National Park – In Motorhome Magazine! We are very excited to announce that our article about Grand Teton National Park is featured in the August 2015 issue of Motorhome Magazine. The Tetons are located in Wyoming, just south of Yellowstone National Park, and all we can say is Grand Teton National Park is a stunner. We have been there three times now (once was a quick drive-through due to wildfires), but our visit last summer was the longest and most in depth. We were there almost three weeks! If you have been to the Tetons, you know how majestic this park is. If you haven’t been yet, it belongs on your bucket list!! RV travelers often plan a big trip to Yellowstone, and that is a wonderful park. But they often don’t leave enough time to see more than a brief glimpse of the Tetons. Hopefully this article will inspire folks not to shortchange themselves and to allow plenty of time for hiking, biking and even boating in this spectacular park. Before we began RVing full-time, we found the various RV magazines were very helpful learning tools, and we still subscribe to quite a few! Sun Valley Idaho – in Trailer Life Magazine! 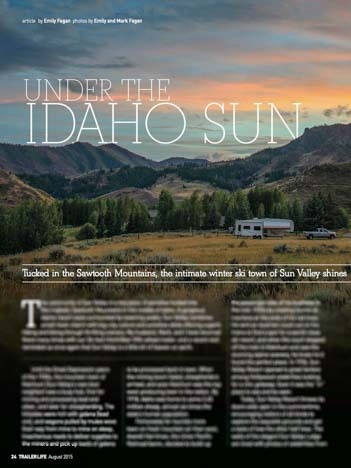 The August 2015 issue of Trailer Life Magazine is featuring our article about beautiful Sun Valley, Idaho. Entitled Under the Idaho Sun, it is the third feature article we have published in a magazine about this area since we first went there in the summer of 2009 (the others were in Highways Magazine, August 2010, and RV Journal, Summer 2011). Sun Valley is just that special! Some folks think of Sun Valley as a winter destination, but it is loaded with activities and events all summer long, from outdoor pursuits like hiking and biking to cultural pursuits like free symphony concerts and art walks to unusual events like outdoor ice skating shows and figure skating competitions. One of the most unique annual gatherings is the Sun Valley Road Rally where folks with deep pockets and fast cars drive as fast as they can on a two mile stretch of the stunning Sawtooth Scenic Byway for charity. The 2016 edition of the Road Rally took place last weekend. We saw the first edition of the race when it was won by a college age kid, along with his sister and parents, took a turn at the wheel of the family Porsche. He hit 188 mph. Last year we watched it again when it was won by a young entrepreneur who hit 246 mph in his $3 million Bugatti Veyron. Perhaps even more impressive, though, was that a little old 81 year old granny hit 161 mph in her flashy yellow Corvette. MSN (Spanish Edition): The Fastest Grandmother In The World! Watching a car race on the open road is just one of the many fun things to do in Sun Valley, and we have enjoyed ourselves immensely each time we have taken our RV to the area. Trailer Life Magazine is published by Good Sam Club, and if you join the club you get a few issues of the magazine as part of the sign-up package. You can also buy a year’s subscription to the magazine here: Subscribe to Trailer Life. It’s a good magazine that covers all aspects of living the RV lifestyle with a towable RV. Sun Valley Idaho – An RV Traveler’s Delight in Ketchum, ID! 09/16/16Sun Valley Idaho is a great RV travel destination with loads of outdoor activities and free symphony concerts in August. Craters of the Moon + Cataclysms from Sun Valley ID to Alpine WY 09/02/14Volcanic cinders at Craters of the Moon NM capped our cataclysmic theme of wildfires and floods from Sun Valley ID to Alpine WY! The Artsy Side of Sun Valley, ID 08/26/14Sun Valley has free goodies for every taste: art walks (with wine), symphony concerts, and camping. Ice Queens of Sun Valley, ID 08/21/14After biking the trails between the mountains, we enjoyed some beautiful figure skating competitions in Sun Valley Idaho. Sun Valley Road Rally – Go Granny Go! 08/16/14From an 81 year old granny to young gazillionaires racing Bugattis, the car racing was on at the Sun Valley Road Rally. Sun Valley Idaho – Music, History & Celebrities 08/15/09Sun Valley Resort has it all: outdoor ice skating, a historic lodge lined with celebrity pics, and nightly outdoor symphony concerts. Sun Valley Idaho – RV Camping, Car Racing & Skating Legends 08/06/09Sun Valley ID (Ketchum) always has something going on, from free movies to car races. And the camping is fantastic! Sun Valley & Ketchum ID – Beauty & Fun in the Mountains! 07/25/09Ketchum ID, home of Sun Valley Resort, is so charming we stayed for a month soaking up the great atmosphere & views. Hydraulic Disc Brake Conversion – In Escapees Magazine! 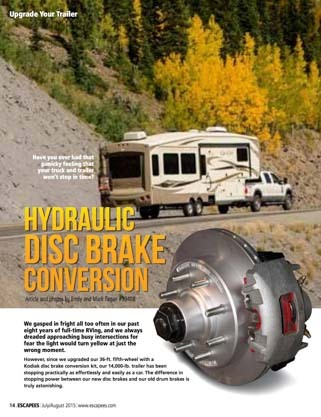 The July / August 2015 issue of Escapees Magazine is featuring our article about upgrading our 36′ fifth wheel trailer with a disc brake conversion. Now that we have taken our RV onto the congested, fast-moving and rather scary roads of the northeast, we are relying on our rig’s braking system like never before. We are so glad we have truly outstanding brakes!! It seems that on a daily basis, whether in Virginia, New York, Maine or Nova Scotia, we are finding ourselves in heavy traffic. Too often we’re getting cut off by zippy little cars and/or coming down big blind, curving descents to be jolted to a stop by a red light. Slamming on the brakes while towing is just part of the deal out here. Before we came out to the eastern states, we upgraded our trailer’s brakes from factory installed electric drum brakes to electric over hydraulic disc brakes. It’s not a cheap upgrade, but it is very worthwhile. Trailer Disc Brake Conversion – Electric Over Hydraulic Disc Brakes – WOW! Escapees Magazine is published six times a year by Escapees RV Club, an unusual and very valuable club for anyone who owns (or would like to own) an RV. The club provides a myriad of services for RVers, from mail forwarding to discounts at RV parks to specialized RV weighing services to assisted living for elderly RVers to social groups, rallies, training for newcomers and travel caravans to Mexico and other exotic places. A few months ago we took a trip to the Escapees RV Club Headquarters in Livingston, Texas, and despite being there during a deluge of rain, we had a wonderful time. See our blog post about their unusual headquarters campus here. Recently, we were honored to become featured bloggers on the Escapees website. If you are looking for inspiration or information from RVers who are out here living the RV lifestyle, check out the Escapees featured bloggers page. Members who have registered and logged into the website can click here to see the full suite of the latest blog posts as well as create their own blogs to share their travels and tips. 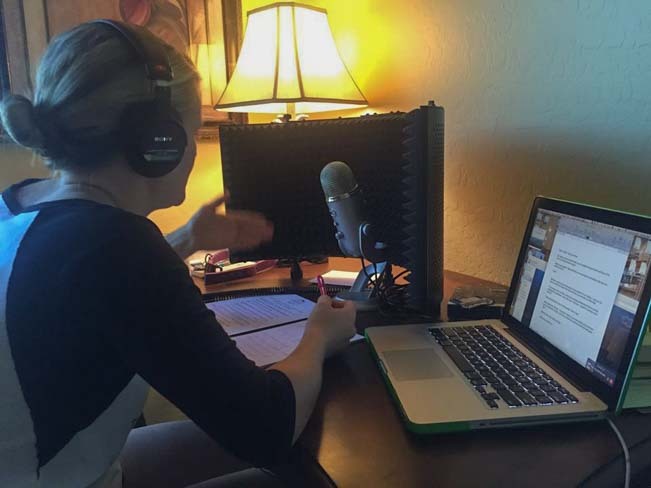 Keep Your Daydream Podcast – An Interview with RLT! 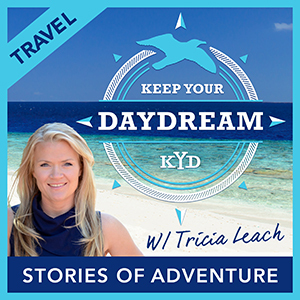 There is an exciting new podcast, Keep Your Daydream, that has recently begun production, and Mark and I were interviewed for one of the episodes. This is a very cool podcast that has quickly climbed the charts at iTunes, ranking #1 in its category withing a few short weeks of its debut. If you want to hear what our voices sound like, click the link below to listen to 46 minutes of us telling stories about how we got started in this crazy full-time traveling lifestyle and what our life is like now! The origins and purpose of this podcast are near and dear to our hearts. Back before we started traveling full-time, we were avid cyclists in Arizona, and Mark’s good buddy Marc Leach was a particularly speedy cycling friend. Mark and Marc happily duked it out on many a hill climb, and a great friendship was forged during night races on the city streets after work. 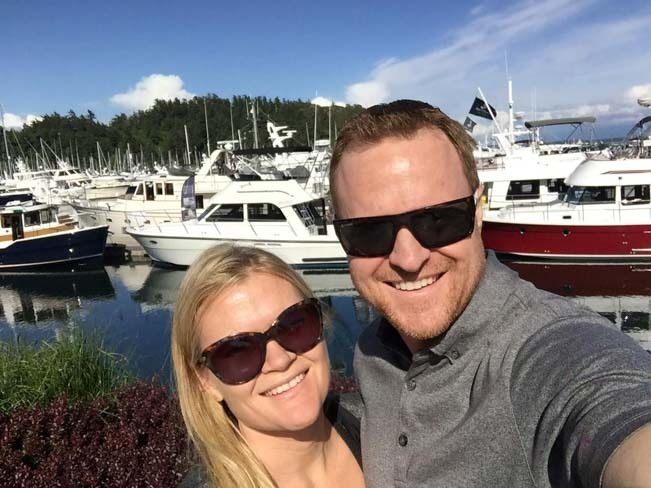 Nowadays, Marc Leach and his wife Tricia are dreaming of casting off on boating adventures, perhaps following in our sailboat Groovy’s wake, and likely going much further afield. However, they have three kids to finish raising first. 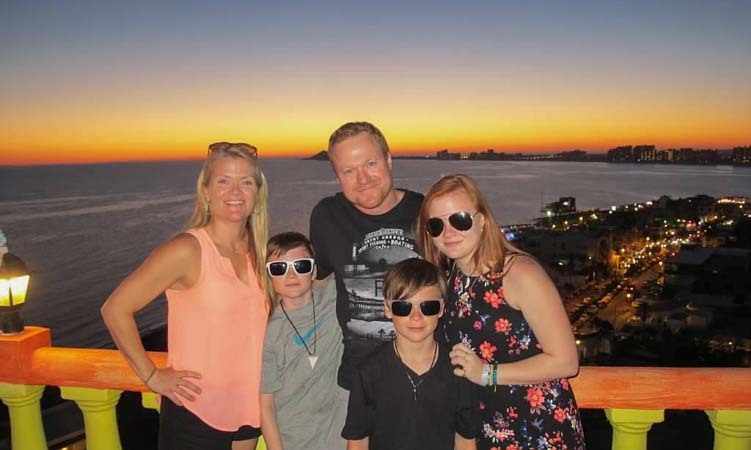 Right now Marc and Tricia are busy raising their kids — but their travel dreams are very much alive! This is probably a familiar story for many people — the dream is there, but the circumstances aren’t quite right, yet! So, how are they keeping their daydream alive in the meantime? They are introducing themselves to the people that are out there doing it, and they are interviewing them to find out what it’s like to jump in with both feet and live your dream!! And they are sharing these interviews with anyone that has an internet connection. What a truly inspired idea!! Together, they have scoured the internet looking for interesting adventurers who are living an unsual lifestyle and fulfilling their dreams. From RVers to sailors to a guy that spends each year living in a new country to a young mom traveling Greece with her son, they are finding truly daring and unique folks. Rather than just sitting back and reading these travelers’ blogs, Marc’s wife Tricia, a former fitness champion, gets up the nerve to contact the travelers themselves, wherever they are in the world, and set up a Skype interview with them. What we loved most is that Tricia is a super interviewer. She’s upbeat, she’s got great questions, and she’s really fun to talk to. There are thousands of outstanding RV, sailing and adventure travel blogs out there these days, but unfortunately there are still only 24 hours in a day to read them all. The great thing about Keep Your Daydream is that for anyone who spends hours in their car, you can listen to it as you drive. I did hundreds of thousands of miles of commuting when I worked in the corporate world. I think Mark did even more! How wonderful it would have been to have spent those hours listening to entertaining interviews with people who were living adventurous lives far from home. Even though that life couldn’t have been mine at the time, I would have come away from each episode inspired and excited. Kudos to you guys, Tricia and Marc, for a great new podcast. We can’t wait to hear more!! 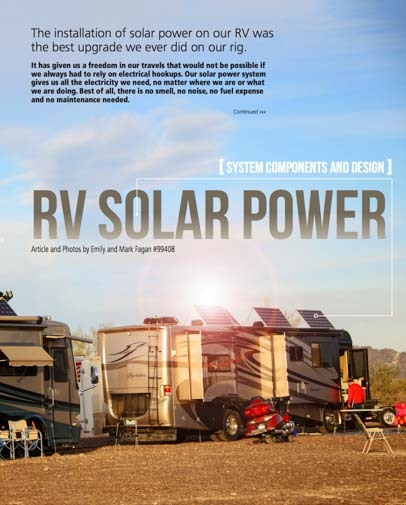 The May/June 2015 issue of Escapees Magazine is featuring our article on the basics of RV solar power. Installing a solar power system is an awesome upgrade for any RV, whether you are using it for weekend and vacation travel or are living in it full-time as we do. Yet there is a mystique about solar power that sometimes makes it seem like a much bigger deal than it really is. In this article I wanted to make the whole theory behind getting electrical power into an RV without electrical hookups as straight forward and easy to understand as possible. It just isn’t as complicated as it seems! So, if you aren’t a techie, I hope this article gives you some visuals and explanations that make sense! As for the magazine this article is appearing in, it is the club magazine for Escapees RV Club, an incredibly diverse club that caters to the widely varying needs of all RVers — whether young, old, rich, poor, single, family, traveling or parked! 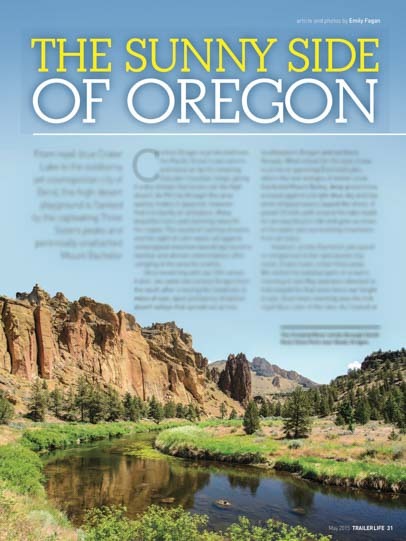 Trailer Life Magazine Feature – The Sunny Side of Oregon! 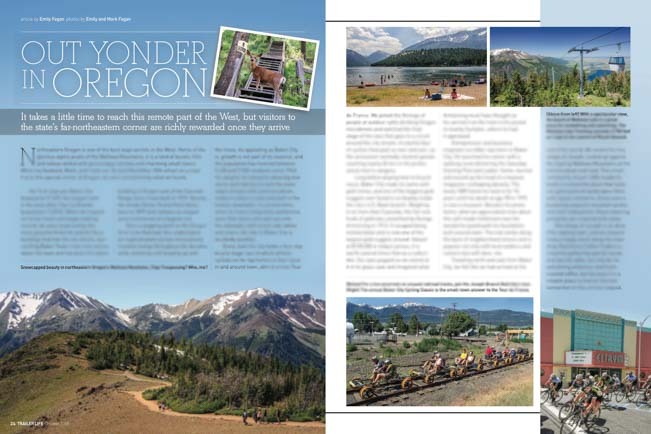 The May, 2015, issue of Trailer Life Magazine is featuring our article, The Sunny Side of Oregon about the fun and pretty sights we saw on our RV travels in central Oregon. Central Oregon is a fabulous area for RVing. The hip and trendy city of Bend is at the heart, and there are lots of things to see and do heading in every direction from town. From the absolutely stunning royal blue vistas at Crater Lake National Park to hiking and rock climbing at Smith Rock State Park to seeing gorgeous waterfalls along the McKenzie River to riverside camping on the banks of the Lower Crooked River, the whole area is an outdoor lover’s paradise that is ideal for an RV roadtrip. The May issue of Trailer Life can be found on the magazine racks of big bookstores like Barnes & Noble and at camping and RV supply stores like Camping World. We are subscribers to Trailer Life, and a 12 month subscription can be purchased at this link. Trailer Life Magazine is published by the Good Sam Club and offers not only travel destination stories like this one but lots of RVing tips and product reviews as well. We’ve been subscribers for many years! Find more of our published magazine articles and cover photos in our Press Room page.